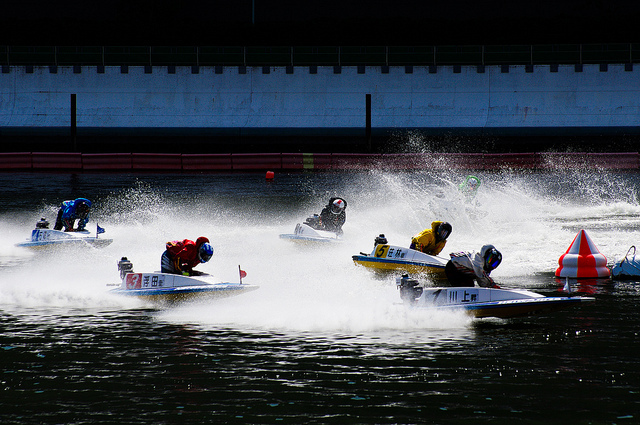 Chances are that the first sport that comes to mind when you think of Japan isn’t powerboat racing, but every day thousands of people go to watch races at stadiums all over Japan. 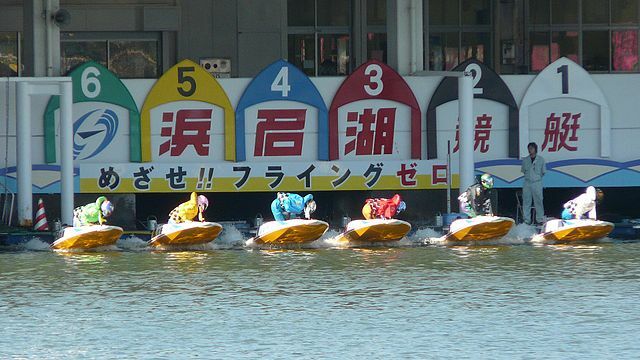 The reason boat racing is so popular isn’t so much because of the sport itself, but because betting on boat races is one of Japan’s few legal forms of gambling. Regardless of whether you’ve got any prior experience of powerboats, a day at the races is a great chance to experience an aspect of Japan that’s little known overseas, and if you get lucky you might even end the day with more money than you had when you set out. 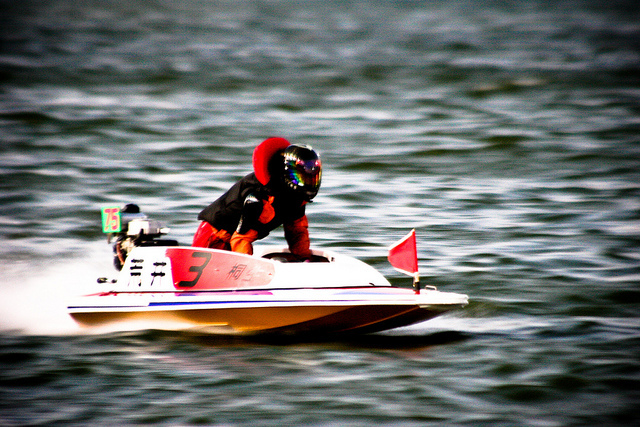 Powerboat racing is officially called ‘BOAT RACE’ or ‘Kyotei’ (a Japanese word that means exactly the same thing), and it’s one of only five sports in Japan on which it’s legal to gamble. (The others are horse racing, bicycle racing, motorbike racing, and since 2001, football.) There are 24 boat race stadiums around the country, some on lakes, rivers or the sea, others on artificial concrete ponds right in the midst of cities. You can watch either from inside a large multi-storey grandstand, or if you want to get really close to the action, from behind a railing that runs along the edge of the racing area. 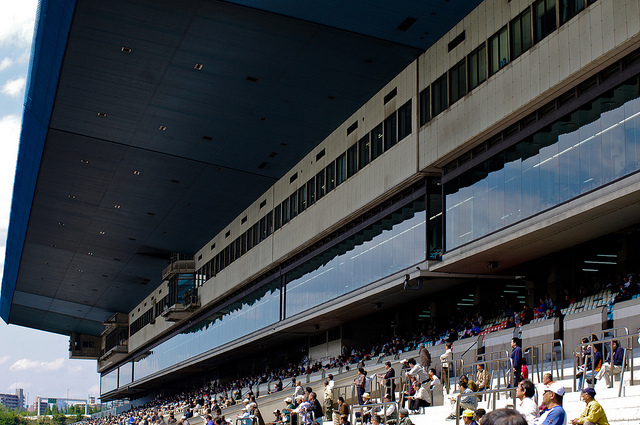 As most of the money comes from betting, entry is really cheap – generally only ¥100 for the whole day. If you’re feeling flush, you can pay a few thousand yen for a reserved seat in the VIP area, or even book a private box. The sport is tightly regulated by a central federation, so no matter which venue you attend, the course and the races are essentially identical. Two buoys are placed 300 metres apart in the middle of an artificial pond, or a sectioned-off body of water, that’s around 400 metres long by 150 metres wide. Six drivers take part in each race, and the first one to make it across the finish line after going around the buoys three times is the winner. This might sound very straightforward, but a large part of the competition takes place before the boats cross the start line, and some of it before the drivers even get into the boats. The boats all belong to the stadiums – for each race the drivers are allocated both a boat and an engine by lottery, and the only part they are allowed to supply is their own spark plug. (Until April 2012 they were also allowed to attach their own propeller.) The drivers then have a limited amount of time before the race begins to tune their engine. They have to do this themselves without any help, so winning requires mechanical expertise as well as driving skill. All the boats and engines are essentially identical, made to a design that has hardly changed since the start of the boat races in 1952, but punters avidly keep track of which boats and engines have the best track records, in an attempt to gain an edge when they place their bets. When the boats are ready, the drivers take to the waters for a practice race, followed by timed 150-metre runs. This is partly to test the boats, but mainly to give the punters another chance to assess the field. Only now is everything ready for the race itself to begin. The boats all start side by side in a dock, and on a signal they head towards the start line, go round the first buoy, up the back straight, round the second buoy, and then turn towards the start line again. None of this is actually part of the race, it’s all about jostling for position, while all the time a giant clock counts down. The drivers aim to cross the start line at full speed just after the clock reaches zero, so a few seconds beforehand they all surge forwards. If a boat crosses the start line too early, the driver is disqualified and receives a thirty-day suspension, but if they cross much afterwards they’ll have no chance of winning. The race continues for three laps, but the outcome is usually determined by who is in the lead after coming round the first buoy, and the whole event is over in about a minute. Leaving the docks at Lake Hamana Stadium, Shizuoka Prefecture. Six boats take part in each race, and every driver wears a coloured jacket that matches a flag on the front of the boat. What makes boat racing exciting is roar of acceleration, the speed and close proximity of the boats, and the frantic jostling for position. The drivers huddle down inside the boats as they zoom down the straight, then stand up, to slow down for the corner, using their bodies as air brakes. The boats reach 80km/h on the straights, which is really fast for such a confined space, and they crowd so close together on the turns it’s a miracle that they don’t collide every time. Of course all of this is made more exciting if you’ve got money at stake, especially when you’ve picked a winner. If the bewildering array of statistics on past-performance of drivers, boats and engines leaves you bewildered, then there are tipsters on hand who will give you some advice on placing your bets, for a fee of around ¥100. You can simply bet on the winner, try to predict the first three finishers in order, or choose one of several options in-between. Despite its huge popularity, you’re not likely to see much mention of boat racing in the mainstream media, and its image is so bad that many Japanese people would probably rather that foreign visitors never got to see or hear about it. If you ask a respectable Japanese person, they’re likely to tell you that everyone who goes to boat races is either a delinquent, a criminal or a gangster. Kyotei certainly does seem to be popular with those sections of society, but given Japan’s low crime rate, the majority of attendees must surely be honest and upstanding members of society. These windows are all for placing bets, and the sheer number should make clear how central gambling is to boat racing. That said, the demographic at boat races is very distinct from what you encounter at Japan’s mainstream sightseeing spots. Working class men of middle age or older dominate, there are few women, and hardly any children at all. But don’t let this put you off – the boat race community is friendly and welcoming. Part of the reason for attending is the camaraderie – sharing in others joy at winning, and consoling each other when you lose. To be sure the facilities tend to be very functional – but that seems to be how people like it – the boat racing community has no pretences of any airs or graces. Japan’s 1,500 or so professional racers tour from stadium to stadium, each racing around 8 to 15 times a month. Around 10% of racers are women, who compete on an equal basis with men (although there are special women-only races too). Women have the advantage that, as they are generally lighter than men, their boats can go faster. To have a chance of winning, racers need to be under around 60kg. In order to prevent racers from starving themselves in an attempt to gain an advantage, any racer under the minimum weight of 47kg for women and 50kg for men has to carry additional weights. All racers undertake a year of training at the boat race federation’s academy in Kyushu. Competition to enter the academy is fierce, and is controlled by an entrance exam. Out of around 2,000 applicants each year, who can be aged anything from 15 to 29 years old, only about 60 will be accepted. The boat race federation covers most of the training costs, making the sport much more egalitarian than any other form of motor racing, but the academy’s regime is so rigorous and gruelling that at least a third of those who start the training drop out before the year is up. Rounding the corner at Heiwajima Stadium in Tokyo. It’s amazing that the racers manage to avoid collisions. The motto of the academy is ‘Strictness in training, cheerfulness in livelihood’, and it puts at least as much effort into developing character as it does into teaching racing skills. The trainees sleep in dormitories and wear uniforms throughout their training. Every day they get up at 6:00am, and lights-out is at 10:00pm. The school is perhaps more like a military training camp than a sports academy – regular activities include marching and standing to attention. Trainees are required to show respect to the teachers at all times, and the syllabus even contains lessons on table manners. Mobile phones are banned, and the trainees are only allowed to make phone calls once a week, and are only allowed to go out at weekends. The training itself is split between actual boat driving, and the mechanical skills needed for tuning the boat engines, but I suspect that main purpose of the academy is to serve as an extended rite of passage, ensuring that all racers have made a really firm commitment to their sport. It certainly seems to work, as once they’ve gone through this initiation, many racers keep on competing into their fifties and beyond. Each race day consists of 12 races, typically starting at around 10am and going on all day, though a few courses host evening races instead. 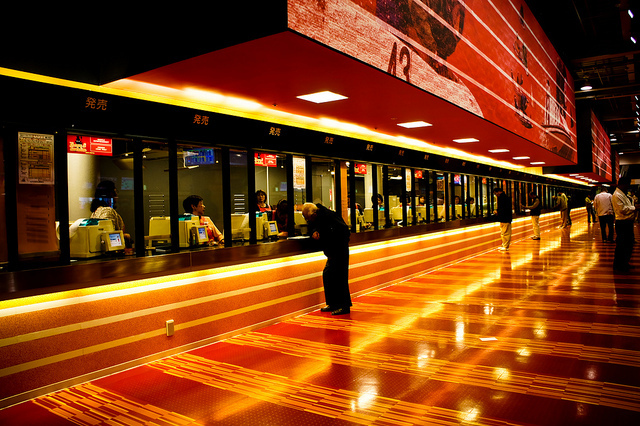 There are boat race stadiums throughout western and central Japan, but none in the northeast. (It’s a bit too cold for water-sports up there.) You can find the locations of all the stadiums on the official boat race website. The ‘boatpiers’ that are listed on the website aren’t actually racing venues – they’re just places where you can place bets and watch the races on TV screens. A monthly schedule of forthcoming races appears here. It’s only in Japanese, but with a bit of effort you’ll probably be able to work out when there are races on at each stadium. (On peak days there’s racing on at almost all of them at once.) I’d like to wish you good luck with your bets, but even if you don’t win, a day at the boat races can be great fun.